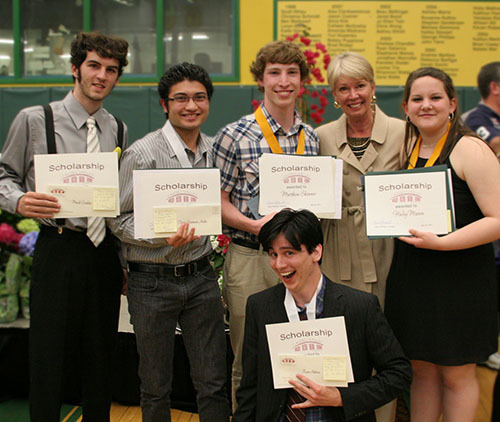 The Castro Valley Arts Foundation (CVAF) Scholarship was initiated in 2009. 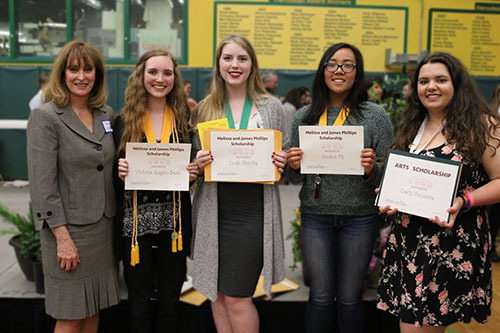 The Scholarship is a monetary award for college bound CVHS seniors who have contributed to arts programs at the Castro Valley Center for the Arts. Initially conceived as a Theatre Arts scholarship, it was expanded in 2011 to include all of the arts disciplines practiced at the CFA. Funding for scholarships is provided by the community who purchase concessions at CVAF shows at the Castro Valley Center for the Arts. 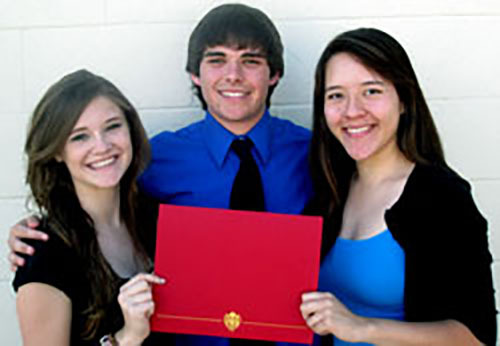 Multiple scholarships may be awarded in the same year. 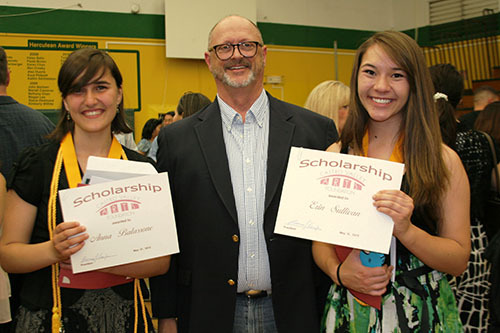 Applications for the scholarship are available through the Castro Valley Education Foundation each spring for CVHS seniors who will graduate in that same school year. 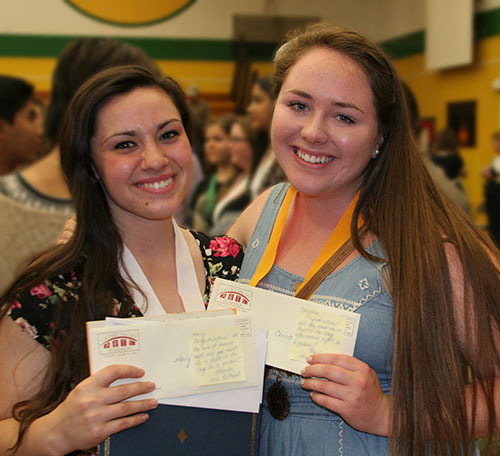 All applications are reviewed by members of the CVAF Board, and are distributed at the CVHS Senior Awards night. As an Air Force officer today, I look back on my time in the Castro Valley choir, drama, and technical theater programs as one of the most formative and transformational periods of my life. Skills and talents I nourished in embryo in both middle and high school, like public speaking, interpersonal communication, and leadership benefited me greatly throughout college and are now called upon daily in my military career. I know of no other arena that offers students such a diverse set of positive, confidence-boosting experiences and fosters a community where every participant feels like a welcome, contributing member of a tight-knit team. 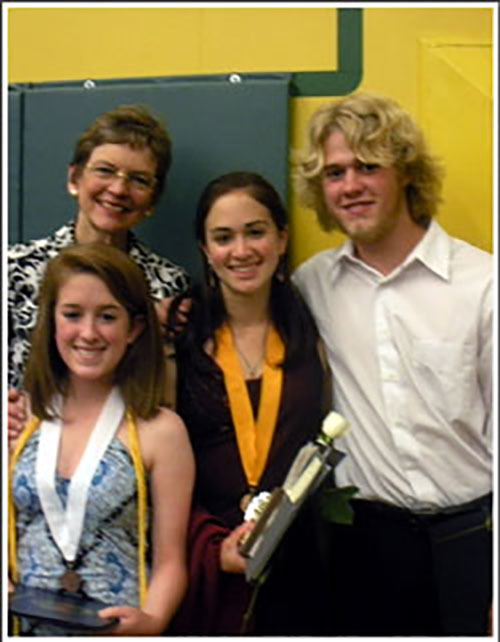 Throughout my years at CVHS, I was deeply involved with the performing arts. I sang in the CVHS choir all four years, was in the CVHS Pops musical leading to my role as a Pops director my senior year, and performed in 3 springtime musicals. The CVHS arts programs were incredibly important to me during high school and shaped who I am today. Performing arts was an escape from the routine schoolwork, making me smile even on days where I was stressed and sad. I found a family in the people in choir and musicals whose constant support I could feel even in the glare of the spotlights. It gave me leadership and teamwork opportunities that were irreplaceable and guided me to find my strengths and weakness. In college, I continued to participate in the UCLA Chorale directed by world renowned conducted Donald Neuen. The discipline and passion for the performing arts that I was introduced to through the CVHS performing arts carried me through repertoire that seemed overwhelming and showed me that with hard work and effort, you can accomplish amazing things. From performing with my fellow cast members at CVHS, I learned teamwork. These lessons aided me with working on two executive boards for organizations with completely different missions than the arts: Phi Sigma Rho, a science sorority to empower women in STEM, and China Care Bruins, a club to mentor adopted children from China. I graduated from UCLA majoring in Physiological Science with a minor in Spanish. I am now pursuing at career as a Physician Assistant and currently work as an EMT in Alameda County. While my academic and career plans are not performing arts and my performing extends to singing Beethoven in the car, having my experiences from the CVHS performing arts is what makes me a more balanced, confident individual today. 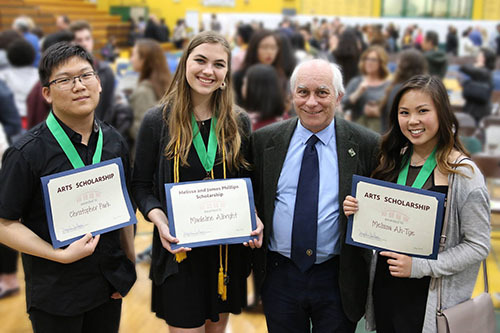 I had the honor of receiving the Castro Valley Arts Foundation scholarship when I graduated from Castro Valley High School in 2014. The scholarship has helped with my current education at UC Berkeley where I am pursing a BS in Society and Environment. At CVHS, I was able to follow my passion for performing, and thrived in the yearly musicals. In the midst of challenging courses, long hours of homework, and an overload of extracurriculars, I found my release while acting onstage and being someone different with every performance. I believe my time in the drama department has helped me find my passion to pursue a J.D. in Environmental Law, as I learned about public speaking, confidence in public image, and confidence in who I am, what I have to offer and what I believe in. I think the best thing we can do is reflect on our experiences and understand what they taught us, because musical theater has taught me so much. It is a special moment to look back and reflect on what I learned from CVHS, and I don’t think I’ll ever be able to put into words what the drama department meant to me. I am thankful for my scholarship, and thankful for my education to pursue my passions. It’s difficult to say that the theatre was my second home in high school without sounding cliche, but if you added up the amount of hours I spent in that building, it would quite literally equate to that status! I’ll never be able to truly summarize the value of the friendships, skills, and memories I built through theatre. Whether it was up in the booth or out on the stage, my involvement in the arts at CVHS is, without a doubt, the reason why I ended up where I am today. Each show helped me find my own voice and fueled my passion for all things entertainment, which ultimately became the path I chose for my career. After college I worked in music and talent relations at MTV, then transitioned to the same department at Nickelodeon. Day to day I program NickMusic, a 24 hour broadcast music video channel for kids. I also act as a liaison for artists that make guest appearances on Nickelodeon’s shows and events, like the Kids’ Choice Awards. 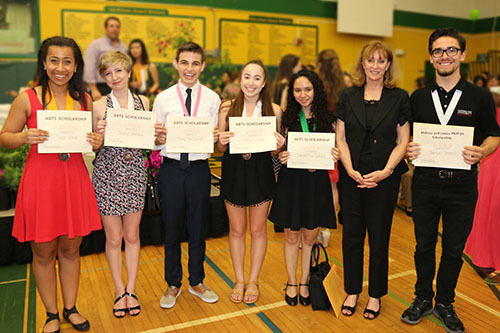 I look back on my time at CVHS with nothing but gratitude, largely thanks to the arts program. It will forever hold a special place in my heart! Getting involved in CVAF shows, student productions, and other events at the CFA gave me so many more opportunities than I could have imagined when I first got involved during my freshman year. Through the CFA, I got my first real job, met many new friends, found and polished a new passion for theatre, earned a big resume item for my college applications, and, most importantly, collected some of my fondest memories from those years. I can’t imagine how different my four years at CVHS would have been without the arts programs there and the various CVAF musicals and programs I participated in. I’ll always be grateful to the CVAF and its supporters for the chance I had to learn from and contribute to their shows! ​In college, I continued pursuing the arts in the USC Trojan Marching Band trumpet section, although I did miss theatre. Nowadays, after graduating from USC with a BS in Computer Science, I work for a tech start-up here in San Francisco. CVHS provided me the beginning of a stimulating and comprehensive arts education. The theatre program there allowed me to discover my passion for Musical Theatre by learning through experience, rather than by sitting in a classroom and taking notes. Being a part of the musicals taught me the value of self-sufficiency and how to continue to work on the material even outside of rehearsal. Being a part of the CVHS choir program and the Madrigals gave me fundamental skills in music theory and sight singing, while also showing me the importance of being a part of an ensemble and working as a unit, while still appreciating each person’s unique talent. Performing in the choir concerts and pops concert taught me the value of all genres of music and that art from any century can inspire all those who come after it. This paved the way for my journey to Emerson College, where I recently graduated with my BFA in Musical Theatre. While the program was rigorous and challenging, I felt prepared to take it all on with the training I had obtained in high school. Without CVHS, I wouldn’t be in New York now, auditioning and performing alongside friends who I’ve met through the arts at CVHS. My arts education, including both the classes I took and after-school activities I participated in, instilled in me the desire to pursue the arts as a career. I just graduated from UC Davis with a degree in Theatre, and the experience I got from participating in choir, plays, and musicals at CVHS helped me thrive in college. I am still performing in shows and I hope to sustain a career as an actor and singer. The arts were a huge part of my experience at CVHS. I was involved in the choir program and the theatre department while I was there. Choir and drama offered me places in which I could feel good about myself (I was always more of a creative person than academic). 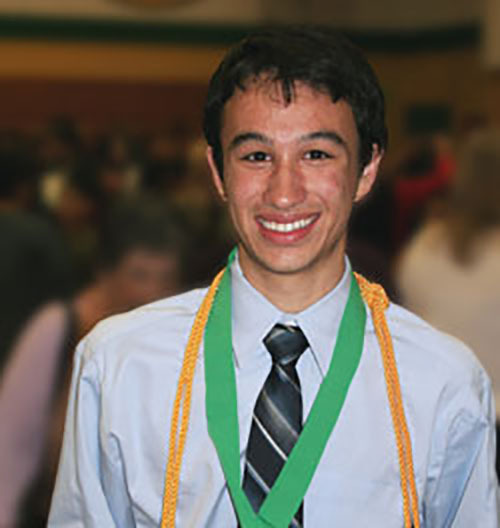 I’ve always been a quiet, shy, and reserved sort of person, but those programs gave me a confidence boost I might not have found elsewhere. The arts allowed for personal growth, teaching me responsibility, dependability, leadership, cooperation, and how to work as a team toward a common goal. I am now a graduate of NYU Tisch School of the Arts and am living in New York, pursuing acting. When I was in high school, I practically lived at the CFA. I measured my year in relation to shows – rehearsals for the CVHS musical, performing in Pops Concert, crewing backstage or in the booth. Nearly all of my favorite high school memories happened in that building. Being involved in theatre gave me the chance to be a part of a team and to contribute to something larger than myself. It taught me about discipline, helped me become a better leader, and made me a more empathetic person. After high school, I majored in computer science at the University of Southern California, with minors in cinematic arts and 3D animation. I specifically chose my major because of how much I enjoyed programming the light board in high school. Now, I’m a curriculum developer at Girls Who Code, a non-profit that teaches computer programming to middle and high school girls. One of my goals is to show girls how technology can be integrated with other fields, including visual art, dance, music, and theatre.